I'd like to start this diatribe with the realization that in posting this (assuming they read it) I'm totally blowing my chances of ever working for Policy Mic in the future. Which peeves me because at some point I'd have really liked to write for them. But, alas, it must be done. First of all, can I just say I am so relieved to have 37 men telling me what they think about women. The pushback wasn't complete without an article highlighting men, guys. EIGHTEEN of the 37 pictures were taken in the same room. Since Policy Mic didn't remark on this, I can only assume they gathered their male employees in the cafeteria or something, and had them hold up signs so they could complete this assignment. I hope I'm wrong. Maybe it was another company who decided to do a project on it. But if that is the case, the project should be recognized, don't you think? Times that by 18. Call me cynical, but the message doesn't have the same impact when it feels like we are being tricked into thinking these were random calls to internet activism by men propelled by their own volition. Also, 26 and 37 are the same picture. Let's take a look at some of the signs, shall we? 5) "It takes strong women to give us the strength to know better." This is in regards to hitting women. I do not appreciate the implication that in order not to be hit I need to be a strong enough woman to teach a man not to do that. 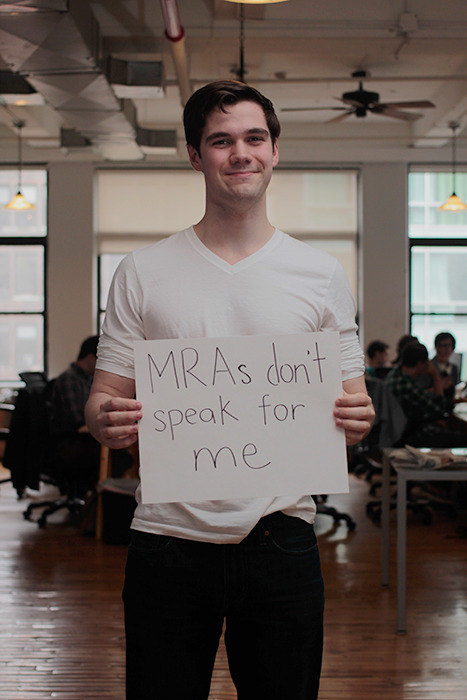 8) "MRAs don't speak for me." ... Not all men. 10) "Because I'm a man and I will never hurt you." Not. All. Men. 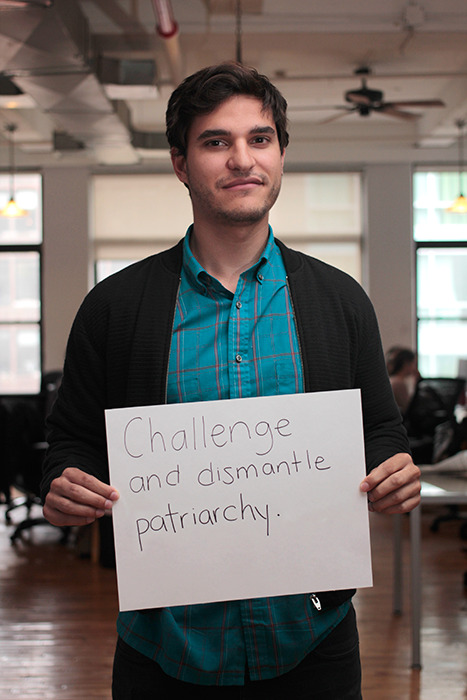 21) "My masculinity doesn't include misogyny." NOT ALL MEN. 34) Wielding is spelled wrong, but more importantly, it's a sign indicating that the reason men should be involved is that their own safety is at stake. Which might be true. But isn't really what the conversation is about right now. Also important to know that the man in #34 is a writer for Policy Mic. Which they didn't mention. UPDATE: courtesy Brooke Binkowski, San Diego reporter. #18 - PolicyMic editor Michael McCutcheon (and this shows that the room which is featured in half the photos is a PolicyMic room or somehow connected to PolicyMic). (Again, nothing wrong with that, but it needs to be noted in the article, guys). 37) "If there weren't women, there would be no men." Oh. Well. Um, thanks for that brand new information? 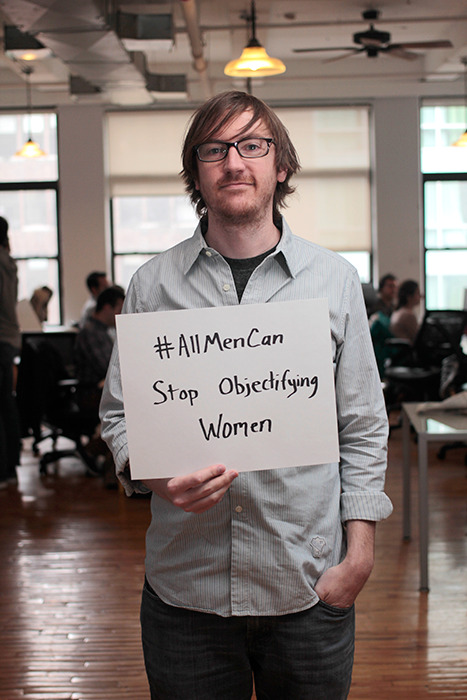 In the middle of this article, they ask us to use the #allmencan hashtag to make our voices known about what men can do. I've said this many, many, many times before, but I'll say it again. And if they were listening, well, maybe we wouldn't feel the need to post articles with them talking over us so much. Who cares if it is staged? It's a positive message, beneficial for all. Is it possible you're missing the ocean by getting caught up in the weeds? Also, #5 is the author's boyfriend. Thought I'd point it out since you highlight #5 in your piece. Great piece, by the way. All reasons I stayed away from it when I saw it. As I read/looked through the article in question, I too noticed that many of the photos were in the same location and questioned whether or not the individuals really believed what they were 'saying.' After looking up Policymic, I think that there is a decent chance that individuals within the company volunteered to aid in this project - in which case I do not believe that it necessarily diminishes what they are trying to do. That being said, I understand entirely your point about [again] turning the focus to men but: as too many women have already vocalized, many men do not listen to or take us seriously. Too many men, even those who do not necessarily objectify women, are uncomfortable with "feminism" and will not attempt to understand the issue simply because a bunch of women keep using a hashtag or re-posting an article, particularly if it's from the female perspective. Therefore, I think it's good for there to be articles such as these, that demonstrate to other men the importance of feminism. It may not be focused most directly on all of the issues, but things are not going to change over night, not by any means. In fact, it will take several generations, and to get men to start becoming more comfortable with these ideas, there MUST be other men to set an example. It's not the most ideal, but it's a better place to start that any we've seen thus far and I will take it. I don't get uptight when men want to speak to other men. The language they choose, so long as it is respectful of women isn't mine to critique. 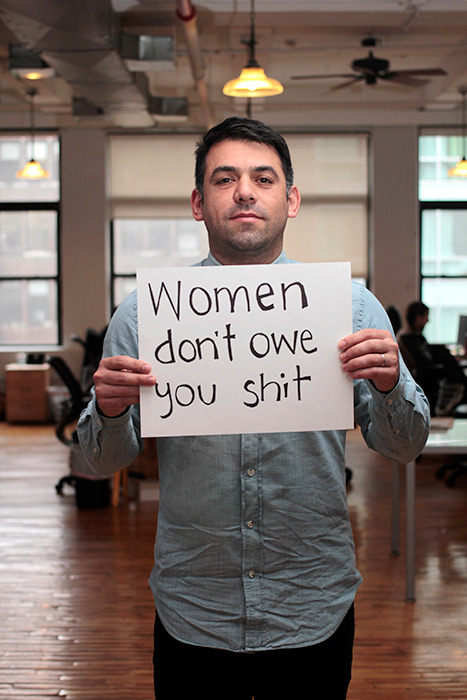 Some of the messages there are for women, but most seem aimed at men. I dont' think its fair to constantly urge men to join feminism and be allies (with all the attendent expectations) yet criticize the way they relay that experience to other, non-feminist, men. While its important to remind them occasionally what "respect" really means and how feminism is for everyone, I dont' think they need us to tell them how to talk to other men.